In part 2 of How Keeping the Jewish Sabbath was Abolished in Christianity, we focused on Yeshua (Jesus) and Sha’ul (Paul) going to synagogue on Shabbat as was their custom. We also showed how Sha’ul was concerned with Shabbat ordinance which implied quite clearly that he kept Shabbat. We then went on to discuss Hebrews and some of the implications from that. In neither of these 2 parts do we see the Sabbath (Shabbat) being abrogated – In fact, we see Shabbat being observed – even after Yeshua’s death. Today we deal with the main verse that is used to justify abrogation of Shabbat. We don’t see from this that they “ONLY” met on Sunday – it is not there. We don’t see anything about Shabbat in this verse – Is the argument from silence valid here? Can we be sure from the 2nd sentence that they “only” gathered together to break bread on Sunday or does it simply state what they were doing when Paul began talking to them? Why keep Shabbats that are festivals and not the holy Shabbat commanded in Exodus – the day that God set apart and separated for himself? 6 days of work in this commandment. You shall labor, not rest. Shabbat is rest – cessation from work. Adonai accepted Hevel and his offering . . .
5 but did not accept Kayin and his offering. Kayin was very angry, and his face fell. 6 Adonai said to Kayin, “Why are you angry? Why so downcast? shouldn’t you hold your head high? I have showed you some of the arguments and I have showed you some counter arguments. However, it seems clear based on on the evidence presented so far that Shabbat was not abrogated at, or because of, Yeshua’s death. It is clear that Sha’ul was a Jew that kept Shabbat as part of the Torah commandment. Since Sha’ul was Jewish and was born after Yeshua died, and since Yeshua’s talmidim (disciples) were also Jewish, it is easy to surmise that if Shabbat had been abrogated, at least a few would have objected to Sha’ul’s custom of observing Shabbat if it had been abrogated, wouldn’t it? Since the name of this post is How Keeping the Jewish Sabbath was Abolished in Christianity: Part 3, When did it happen? The text would indicate that it had to happen sometime later. The first time period in the history of Christianity is Jewish because the 12 apostles were Jewish. Most of the followers were Jewish. The leaders were all Jewish. They kept Shabbat, they kept the festivals and they followed Yeshua. It is called the Apostolic Age. It is presented as a time span from the death of Yeshua (Jesus) to the death of the Apostle John around 115AD. To make this simple, we are talking the 1st and start of 2nd century. No where do we see that any of the apostles remain anything but Jews – albeit Jews that accept Yeshua as the prophesied Messiah – but Jews none the less. So what happens? What happens that causes change – a change that causes the Lord’s commandment regarding Shabbat to be abandoned in favor of worship on the first day – Sunday? There are many different theories from many different camps. I am going to present some history – simultaneous history. As I am not an world renowned expert in church history, bear with me – I am going to keep it simple as I can and dates are approximate. 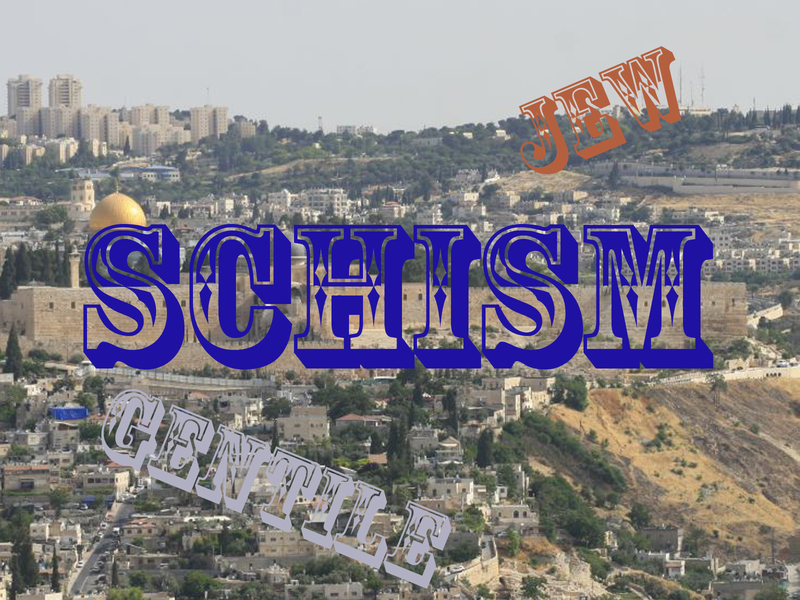 I am going to present it simultaneously so you can see both sides: Jewish contrasted to Jewish followers of Yeshua (Jesus) and as it changes over time, Jewish contrasted to Gentile followers of Yeshua (Jesus). 136 Hadrian builds a pagan temple directly over the site of the 2nd temple and renames Jerusalem to Aelia Capotolina – Jews are forbidden to dwell there. Renames southern part Palaestina. 135 Telesphorus proclaims birth of Jesus a Christian holiday. 300 About ¼ of Roman empire is Christian. Aprox 15 million in empire out of 60 million. 303 Great Persecution – Emporer Diocletian rescinds legal rights of Christians demanding they sacrifice to their Gods. The history gets uglier over time. However, the purpose of this piece is in its title: How Keeping the Jewish Sabbath was Abolished in Christianity. It would seem based on this small snapshot of history, that some feelings got hurt (on both sides) and that changes were the result of those hurt feelings. Is Sabbath abolished in the text? Is Sabbath abrogated as a result of the schism between the Jews and the Christians? I have shown that there is lack of any definitive evidence in the text, and based upon this small snapshot of history, that the Jewish Christians were surpassed in numbers fairly quickly by the rapid influx of Gentile Christians into the church. It would also seem that as Gentile leadership took over the church, there was a push to separate from all things Jewish – including the Jews within their own number. As Gentiles became the majority in the church, the Jewish roots of the church shriveled up and died. Fiscus Judaicus seems to have contributed to this in the beginning. In the end, it seems to be nothing but a rebuilding of the barrier or partition wall that Yeshua tore down with his death – hate rekindled. 18 then don’t boast as if you were better than the branches! The observance of Lord’s day by the early Jewish Christians is not disputed in this piece. They may well have gotten together every Sunday and worshiped together. What is in question, is how keeping the Torah commandment known in this piece as the Jewish Sabbath, was abolished. There is no convincing evidence that they didn’t do both. In fact, based upon the Jewish leadership of the church for the first 100 years, the evidence would seem to point to the possibility of this very thing happening. The evidence also seems to point to a growing tension between Jews and Christian Jews over non-participation in the Jewish revolts against Rome. Even more than that, the Jewish Sabbath seems to be abrogated over time by the Christian church as it become Gentile dominated, as a direct result of anger, whether misplaced or not, directed at the Jews for Rome’s response to both Yeshua and to themselves. based upon some of the writings by the ante-Nicene fathers. This lack of kindness culminates in the abolishment of Sabbath keeping by the synod of Laodicea. While this is not one of the 7 ecumenical councils, Nicea is and was. It is easy to surmise from the history presented that the sentiment of the Gentile church fathers that the church was anti-Jewish based upon their writings. Sabbath keeping was abolished as a result and replaced with Sunday worship. It wasn’t religious – it was personal! “Where does it say that in the text? This entry was posted in History and tagged acts 20:16, acts 20:7, Acts 2:46, Adonai, Christian, christianity, church, Council, custom, Ecumenical, even if, Exodus 20:9, first day of the week, Fiscus Judaicus, Genesis 4, gentile, God, history, Jesus, jewish, jews, Laodicea, Messianic, Nicea, paul, Pentecost, revolt, Romans 11, Sabbath, Saturday, schism, Sha"ul, shabbat, Shavu‘ot, Sunday, Where does it say that in the text?, Yeshua. Bookmark the permalink. Thank you for sharing this. I’m not a historian or a scholar but my question is…….Did they conclude the “Jews killed Jesus” from Scripture or from stories passed down or from where? That is obviously their reasoning behind their “hurt” feelings. If it was from Scripture….did they only pick and choose parts of Scripture as their “foundation” of their Christian Gentile beliefs? I’m an amatuer myself – When you read some of the writings of the 2-4th century known as the ante-nicene fathers, you come across things that are complete contradictions of the text like replacement theology. Many of the things they write about are not about “loving” you neighbor, they are about “hating’ you neighbor instead . . . especially if he is a Jew. You can Google “Jewish deicide” if you want to read about more about the “christ-killer” accusation and what it is. Sergio, forgive me if I jump to conclusions with your post but I have seen many like it in the past and they all go the same way. If it is what I think, then I under the point(s) you are trying to make . . .
Let me clarify, every day is the Lord’s day – He created every single one of them at creation. There is only one day that is Shabbat. That being said, that does not negate that the early Gentile Christians found the day of resurrection to be very important. I have been to Israel and in the garden tomb (one of many possible sites), it has a sign on the wall . . . Praise Ya that he is!!! I will address the SUNday comment briefly . . . The Romans named each day after their gods – including SATUR(N)day. If you are implying the some, or worse yet, ALL of the early Christians practiced Mithraism, I would caution you . . .(think Lashon HaRa). I am going to head off the next part that usually comes up in the “SUN”day debates – before it can even get started . . . the ZEUS for Jesus debate since Iesous was used for Joshua in the Septuagint (written by 70 Jewish Torah Scholars) which totally destroys that argument before it can even get started..
Something to think about, when our King was born, kings came to pay homage to him. They Traveled many miles to do so. It was a big deal – big enough that there are 4 books dealing with the birth, life, teachings, crucifixion, death, and resurrection of our Master. Would his resurrection be any less revered? Any less important? Especially to his talmidim? 5 One person considers some days more holy than others, while someone else regards them as being all alike. What is important is for each to be fully convinced in his own mind. 6 He who observes a day as special does so to honor the Lord.Also he who eats anything, eats to honor the Lord, since he gives thanks to God; likewise the abstainer abstains to honor the Lord, and he too gives thanks to God. 4 who are you to pass judgment on someone else’s servant? It is before his own master that he will stand or fall; and the fact is that he will stand, because the Lord is able to make him stand. I’ll let your read and meditate on the rest for yourself. Be blessed brother Sergio – Shalom! keep the sabbath. to me it is very clear to keep the sabbath. there are too many theories out there as to why not to keep the sabbath. Yet those that keep the sabbath can show you from the bible why we keep the sabbath.